DiscountASP.net is an award-winning web hosting company geared towards .NET developers and provides the best value in innovative, enterprise-class hosting solutions to the global Microsoft developer community. Since 2003 they have offered cutting-edge web hosting on the latest Windows Web Stack, source control and bug tracking with their Team Foundation Server hosting solution that’s available in datacenters located both in the United States and in Europe. DiscountASP.net provides ASP.net Web Hosting on the latest Microsoft Web Stack utilizing Team Foundation Server Hosting, a hosted solution for Source Control and Lifecycle Management for modern applications. TFS hosting gets rid of the headaches, the cost, time commitment and draw on resources associated with managing your own infrastructure and lets your developer team focus on what they do best – developing killer applications. In the past TFS was always managed on-premises but DiscountASP.net now offers a hosted SaaS solution for TFS. DiscountASP.net offers two TFS hosting solutions: TFS Basic, that supports source control and work item tracking and TFS Full, a managed configuration that supports the TFS Basic features and also Sharepoint and Reporting. They are recognized as a Microsoft Partner with the Gold Hosting Competency status and the only shared windows host and TFS hosting provider accepted in the Visual Studio Industry Partner program. DiscountASP.net is also a properly licensed Microsoft Windows Hosting company under the Microsoft’s Service Provider Licensing Agreement Program. DiscountASP.net has won a slew of awards from leading technology publications, web hosting directories and technology resource web sites. They have also won some reader’s choice awards for 5 years straight. DiscountASP.net is a technology innovator and market leader, always trying to break new ground and push the envelope in order to meet the ever-changing needs of the Microsoft developer community. They are experts in ASP.net development and have custom built their own ASP.net driven “instant activation” hosting automation system that is far superior, technologically speaking, to their closest competitor. Customers don’t have to wait a day or even an hour to get their site up and running. Users can start uploading their web applications quickly and easily. They custom built a control panel with ASP.net technology, no cookie-cutter, pre-built hosting control panels are allowed. They also don’t rely on third party hosting automation software or on the open source community for product development. They have an ASP.net hosting system that allows the ability to launch new .NET technology faster than anyone else and they have proven this multiple times with Team Foundation Server Hosting, Windows 2012 hosting, ASP.NET 4.5, WebSockets, ASP.NET MVC 4, Visual Studio 2012, node.js ,SQL 2012, SQL Backup API, Silverlight 5, and others. Because of a strong commitment to ASP.net Hosting and SQL Hosting, they play host to a large community of ASP.net developers, ASP developers and SQL developers who are active on their community forums. This gives them easy access to experienced ASP.net, SQL, ASP community members where they can collaborate and assist with best practice advise for various website development and hosting issues. DiscountASP.net hosts KBAlertz.com, the top source for Microsoft Knowledge Base update email notifications – a valuable resource for the Microsoft Developer community. DiscountASP.net doesn’t skimp on hardware and utilizes two state-of-the-art data centers using state-of-the-art DELL Poweredge Servers that are housed in Tier 1, secure datacenters in both Calfornia and in the UK. DiscountASP.net allows Customers to Test their hosting platform and backs it up with a 30-day money back guarantee. DiscountASP.net provides customers who are setting up new accounts with alternative FTP and URL addresses on their web servers which allows for uploading files, viewing their sites, as well as test any features while their real site is still live somewhere else. DiscountASP.net are not resellers and do not ever outsource their customer service to other companies. They own and operate their own web servers and never use a private label solution from another hosting company. Everything is in-house. Free TFS Proxy servers found in 5 locations around the globe for those users who may be located far from DiscountASP.net’s two data centers. A Free-to-Join program where customers can earn cash or account credit for each new hosting account they help sign up. Urban Turtle scrum tool – $5/mo. 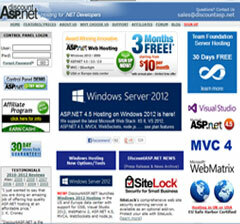 DiscountASP.net focuses strictly on servicing ASP.net developers, providing hosting solutions to solve their needs. They do not host web sites for end users, such as businesses or individuals. They provide personal customer service for their clients that has been crucial in their winning so many awards. They provide strong customer testimonials from those who have worked on ASP.net at Microsoft and other active ASP.net developers. Besides their in-house professionals an active ASP.net community offers assistance to fellow developers on a number of forums that DiscountASP.net is also active on, providing an extra layer of help. If you’re a ASP.net developer DiscountASP.net provides affordable and comprehensive TFS shared and managed hosting and a variety of add-on services unparalleled in the industry.